1686 Dapper View of Cairo, Egypt. WE SELL ONLY ORIGINAL ANTIQUE MAPS - NOT REPRODUCTIONS JOIN OUR WEEKLY MAILING LIST FOR NEWEST STOCK. 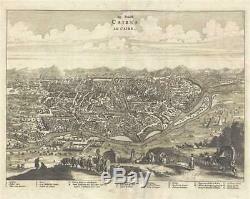 Description: This is a 1686 Olfert Dapper view of Cairo, Egypt. The view depicts Cairo from a hill on the opposite side of the Nile overlooking the city. Cairo stretches out below the viewer nearly to the horizon. Individual buildings are illustrated, and eleven locations are alphabetically identified. A corresponding index, situated along the bottom border below the view, is written in both Dutch and French. In the foreground, traders, craftsmen, and other travelers make their way along the road leading to Cairo, either on their way to the city, or away from it. Horses, oxen, mules, and camels accompany the travelers and are pulling carts, carrying baskets, or supporting riders. The Giza Pyramids and the Sphinx are illustrated on the right, along the Nile. This view was produced by Olfert Dapper and published by in the French edition of Description of Africa entitled Description de L'Afrique and published in 1686. Size: Printed area measures 10 inches high by 13.25 inches wide. Verso repair to margin centerfold separation. If your address is a P. DHL International EXPRESS (45 USD). We can use your Federal Express Account. Additional Services Conservation Framing Services: Geographicus recommends basic conservation framing services for any antique paper. We do not offer this service. Antique Map Restoration Services: Geographicus can repair and restore your antique map. Services include deacidification cleaning flattening and backing. The item "1686 Dapper View of Cairo, Egypt" is in sale since Saturday, May 19, 2018.